Vodka and gin are two of the most popular alcoholic drinks worldwide. Except for a few curious individuals, nobody really bothers to find out the difference between the two drinks that are so popular. Vodka is a mixture of the normal, ‘unpretentious’ alcohol and water. This water in the vodka is slightly flavored or as in the most cases, is not flavored at all. While the gin differs fundamentally in this aspect. The flavor is usually added to by some spice extracts. The spices used in this case would include juniper berries. 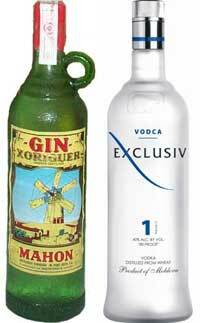 The first drink that is considered to the gin is Genever, the national drink of the Dutch. Gin is a clear spirit that is preferred by bars all over the world. The alcohol is distilled mostly from the grains such as barley and rye. A mixture of herb and spice extract is added to this mixture of distilled grains. This mixture is sometimes called as ‘botanicals’ and it consists of juniper, cardamom, coriander, aniseed along with orange and lemon zests. Once the gin is distilled, it is diluted to the normal strength of 76 to 90 proof. 80 proof gin is called ‘dry gin’. Gin that is produced inÂ different parts of Europe differs in taste too. Gin is produced mostly in United Kingdom, Holland and the United States. The ‘dry gin’ and the ‘London gin’ are the widely requested varieties. Vodka is nothing but alcohol that is distilled to the extent that it has lost almost all the flavor that it has got. Vodka in Russian means ‘little stream’. It has the characteristics of a colorless liquid, clear and smooth. It is a pure spirit with a neutral taste. It is generally distilled from the mixtures of potatoes or grains. The top brands resort to only the distilled mixtures of grains. While wheat and barley are of the top priority, rye is sometimes used. Vodka usually comeÂ in 80 proof strength. But here again, some brands go for stronger alcohol. The flavors that are the hot favorites are generally lemon, pepper and also some other fruits. The way in which vodka serves the purpose also differs from country to country. In the United States of America, it forms the essential ingredient of some other alcoholic drinks such as Screwdrivers and Blood Marys. Vodka is consumed as a straight neat drink elsewhere. 1. Vodka is plain alcohol, without much of a flavor. 2. Gin is nothing but flavored vodka, usually added with spice and herbal extracts. 3. The drinks can be distilled from both potatoes and grains with the latter preferred more. 4. Vodka is the chief ingredient of the alcoholic drinks in U.S. while it is a straight drink in other places. lancetana. "Difference Between Vodka and Gin." DifferenceBetween.net. September 7, 2009 < http://www.differencebetween.net/object/difference-between-vodka-and-gin/ >. So if gin an vodka are so much alike why am I allergic to gin and not vodka? (Depending on the brand there might be other herbs added, some include iris for instance). Wow. Did you even read the article?